Look at the workflow diagram in Figure 1 before scrolling through this step-by-step guide. Keep in mind the incoming message must arrive to Ozeki SMS Gateway's Application Starter User, so it can start any desired process or application. You will find out how your application starts with a glimpse of an SMS arrival. First it is advised to install and configure your own Application Starter User in case of an SMS is received. You should make sure your Ozeki SMS Gateway is ready to receive any SMS from an SMPP provider or a GSM modem. You should start with the installation of the Application Starter User. Click 'Add' on the top right corner of the 'Management' console (Figure 2), so you can select the proper user to install. Alternatively you can click 'Users and applications/Add user or application' from the top menu bar. On the following page you will see a bunch of available users and applications to install with a brief description next to each of them. 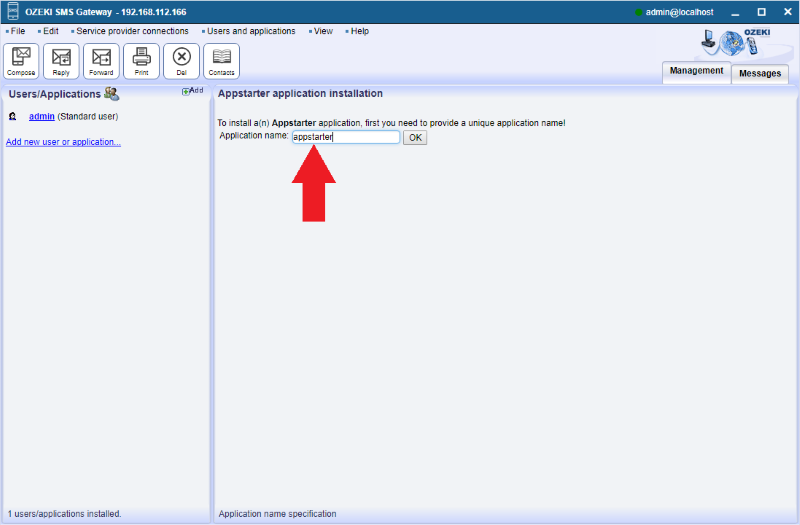 Please scroll down to the Application Starter User and click the blue 'install' button next to it (Figure 3). In this case the left side panel is not used, which shows the already installed users and applications. Please provide a unique username for your Application Starter User. In this guide it is called 'appstarter'. Click 'OK' if you have provided unique name (Figure 4). Now you should have your Application Starter User installed. 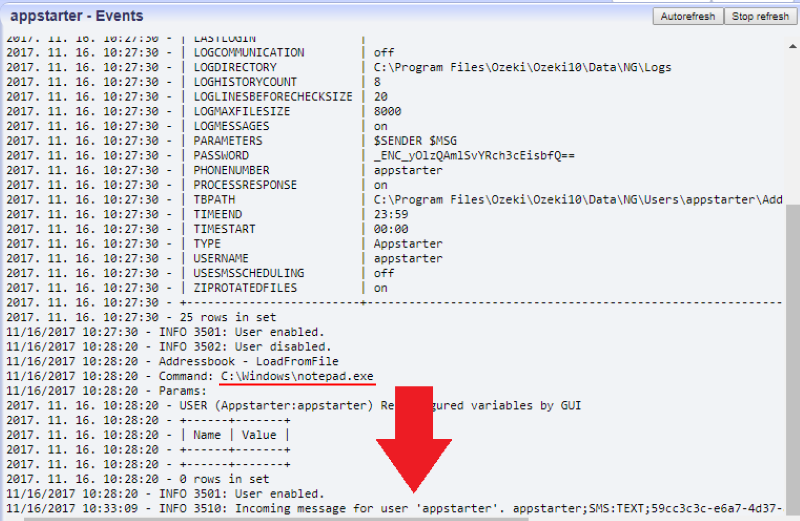 Please set the path to your application's starter file and choose parameters from the incoming message (Figure 5). Later on you can use these parameters in the created process or as the application's command line arguments. You can use the Application Starter User in two ways. The first way is to create a '.bat' file with a bash script included and add the path as seen on Figure 5. 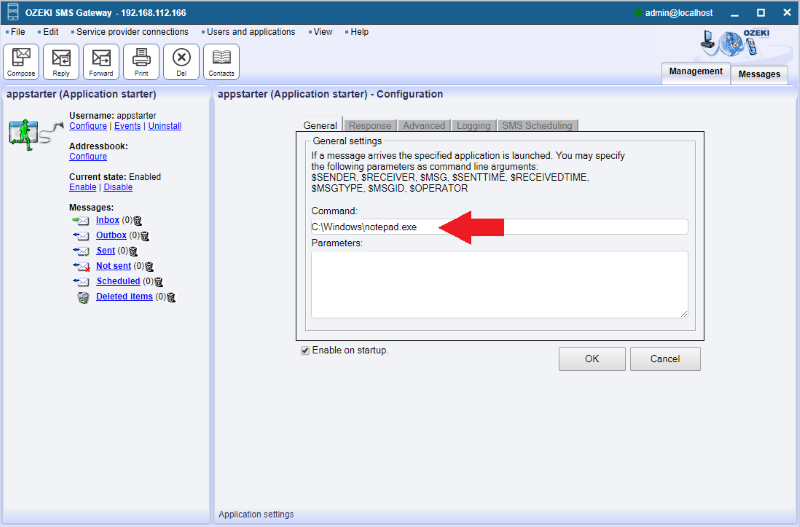 The process you have created will run if the SMS arrives to the Application Starter User. In the current example 'process.bat' writes incoming messages to C:\inputsms.txt in $SENDER $MSG form. The messages are placed into separate rows. A second way is to select a path of your external application (Figure 6). 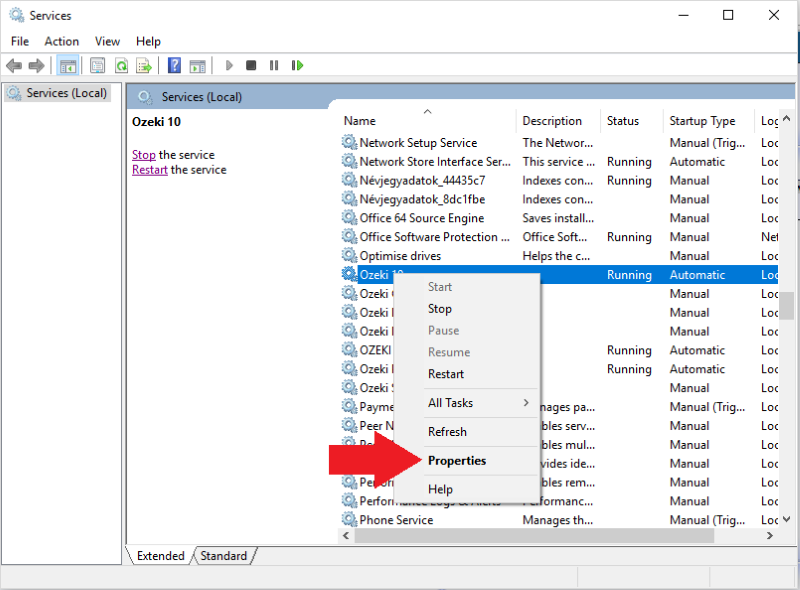 Keep in mind that the application configured in the Application Starter User can be started with the Ozeki 10 service. You can learn more of this service from the next chapter. 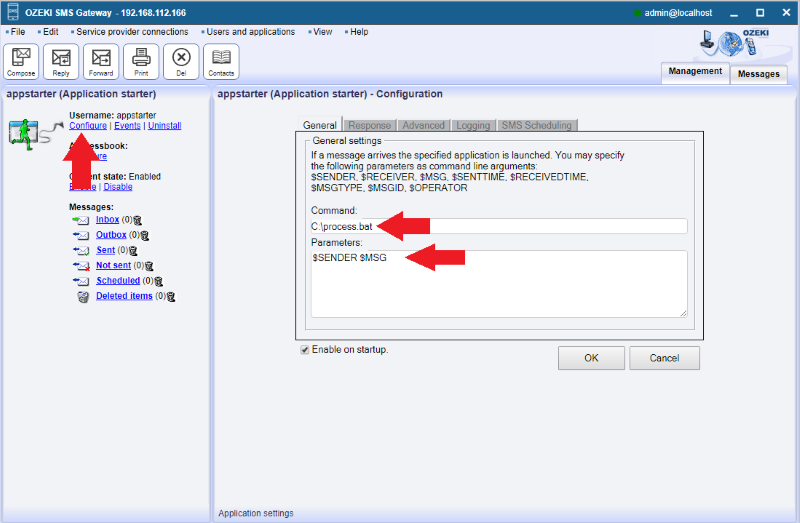 After you have changed the command path, your application will start if an SMS is received. Additionally parameters can be used as command line arguments. 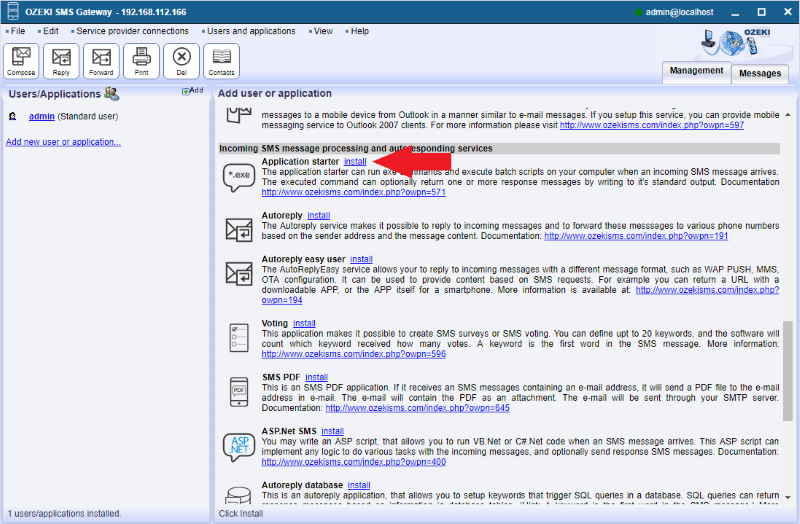 Ozeki 10 service runs in the background when you use Ozeki SMS Gateway. It is essential to allow Ozeki 10 to run files with Application Starter User. Configure this service by selecting 'Control Panel' from your Windows Start menu and reach 'Administrative Tools/Services'. Find 'Ozeki 10' on the list, right click and select 'Properties' (Figure 7). 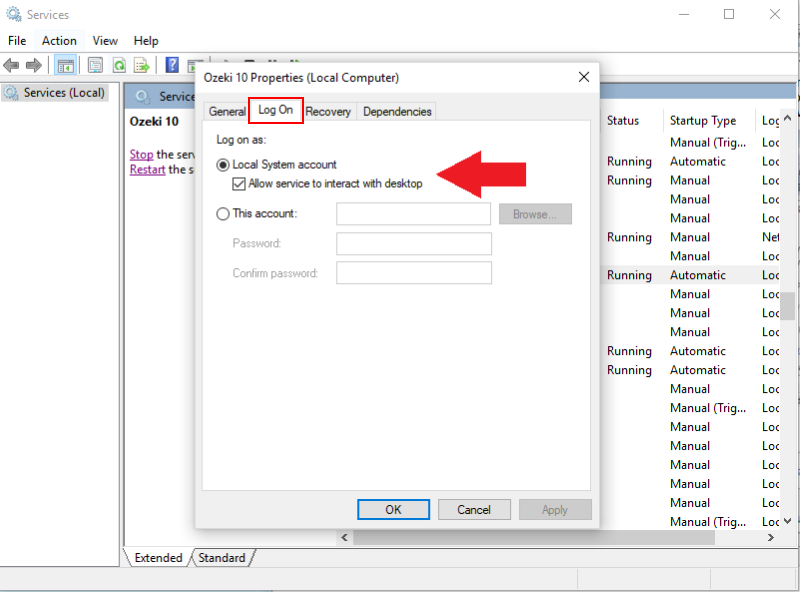 On the new window, called 'Ozeki 10 Properties', please select the 'Log On' tabpage and tick the 'Allow service to interact with desktop' checkbox (Figure 8). From now on Ozeki SMS Gateway's Application Starter User will be able to start any process or application if you provide the proper path to the file. The file on the choosen path will start in case of an SMS message is received. Do not forget to check Ozeki SMS Gateway's routing rules to make sure your Application Starter User receives the correct SMS messages. 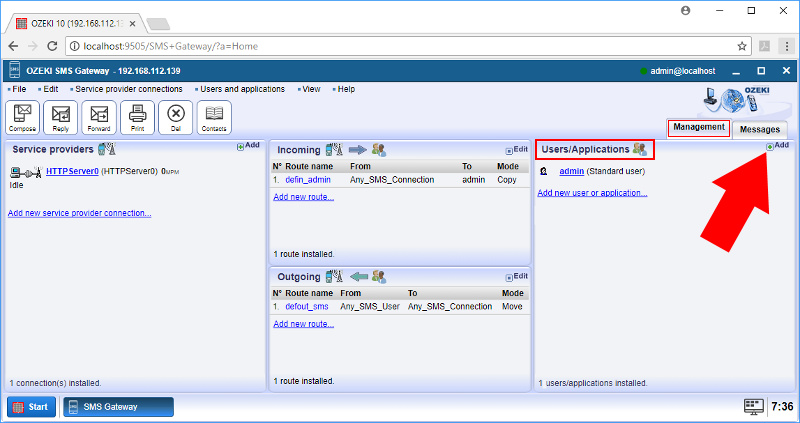 If the rule is not set, please configure the incoming routing rules and set Application Starter User as the destination parameter. In case a message is received by the user, it selects the message parameters you have set and starts the correct application or process. Event logs will be generated at the 'Events' section of the user (Figure 9).